I told you a took a lot of photos at Butchart Gardens. The tulips were in full bloom, mass plantings everywhere. Drifts of pink, fuschia, white and red. The underplantings were just as lovely as the tulips. Clouds of forget-me-nots. I snuck a few hyacinths in as well. They were clustered all along the first walkway into the gardens, perfuming the air with their lovely scent. Another tulip bed, pinks and purples, underplanted with white bellis daisies. Yellow and blue, a classic and lovely combination. Don't forget about the giveaway - just click on the link and comment there. Joining with Mary of the Little Red House for Mosaic Monday. So pretty! Obviously no squirrels to dig them up like I have. The beds look fabulous with the forget-me-nots peeking out. Gorgeous tulips, the various colors are lovely! Your mosaic and post is beautiful. Have a happy week! I love the way they have underplanted, and made a beautiful melange of colours and shapes. Phew! that’s a gorgeous spring garden. 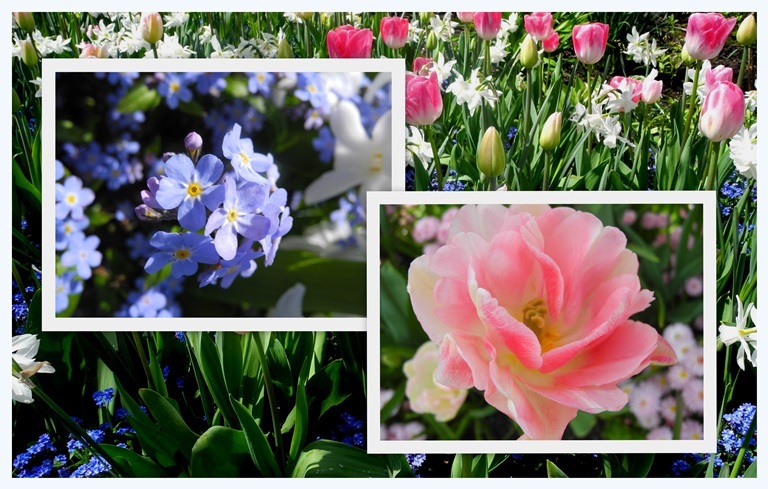 I'm so glad you have the Butchart Gardens nearby - these photos of Spring plantings are outstanding Lorrie! The under plantings of hyacinths and forget-me-nots is quite magical! I'm going to try it in a big planter for Spring - I'll photograph the results. I would love to do my morning walk through there each day - presumably with a members pass to have access whenever it is open??? What a treat to see the lovely flowers that you have access to - I'd be there all the time if I lived just a bit closer - and didn't have to take a ferry to get there. It is hard to pick a favorite - but right now it is the hyacinth and forget-me-nots - just lovely. Beautiful photos --- thanks for sharing them. The flowers are so pretty! I've never seen tulips planted with forget me nots...how perfect they are together! Very sweet! What a beauty! Spring offers wonderful images that you captured so well ! I have always loved forget me nots. What a great idea to plant them with tulips. A beautiful combination. Thanks so much for sharing more from Butchart Gardens. Like sparkling jewels! So many pretty colours to celebrate, Lorrie. Thanks so much for sharing such amazing pictures. So beautiful. I can't wait until retirement in 5 weeks and I can spend as much time I want making my garden lovely. Fantastic! Everywhere I look around here, I see iris blooming... I love spring. What a gorgeous place, and your photographs are amazing. Beautiful...blooms and the quote at the end. I would love to go and see the gardens one day.. Probably am banned from entering after the last time I changed my mind halfway down the long driveway and almost ran into a bus..they were kind of upset with us. What beautiful shots...and now I have some ideas for underplanting. How beautiful that is . I love all the flowery, tulips are my favorites. It must be a beautiful park. I have clouds of forget-me-not here, and I love, love, love them. I must get to BG before the tulips have gone! I'm missing my usual displays of tulips this year - didn't have time to plant in the late winter! These in the Butchart Gardens are so glorious - underplanting certainly makes for a wonderful display. White hyacinths and blue forget-me-nots, how lovely, can smell the perfume from here....almost!!! Wish I was walking there with you Lorrie. Glorious flowers of every hue, simply stunning. Loved walking around the gardens with you, today. Tulips have always been my favorite flower! These are gorgeous!